Our halogen spotlights are a perfect way to light up your roll-up classic, roll-up comfort, roll-up deluxe or roll-up black. 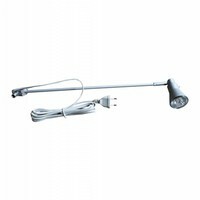 The roll-up halogen spotlight can only be used indoors. The measurements of the roll-up halogen spotlights are 46 x 5 x 7 cm. The spotlights weigh 0.2 kg and have a silver finish. A 50W (GU10) lamp is included in the package. The cable length of the power cord is 270 cm.